The Mahatma Gandhi National Rural Employment Guarantee Act aims at enhancing the livelihood security of people in rural areas by providing guarantee regarding hundred days of wage-employment in a financial year to a rural household whose adult members volunteer to do unskilled manual work. In 2014-15 MoRD has introduced the concept of IPPE (Intensive Participatory Planning Exercise) for the most backward blocks in the country. For Coochbehar district five block viz. 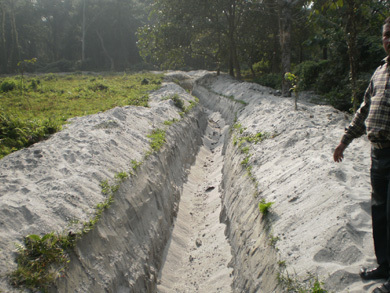 Mathabhanga-I, Sitalkuchi, Sitai, Mekhliganj & Haldibari have been selected for IPPE. The planning process for formulation of Labour Budget of 2015-16 has been completed and same has been uploaded in the website. MoRD has also introduced the system of e-FMS (Electronic Fund Management System) whereby the wage payments of workers are credited directly in to their accounts from the central server. This reduces the delay in payments as well as cuts out the middleman. 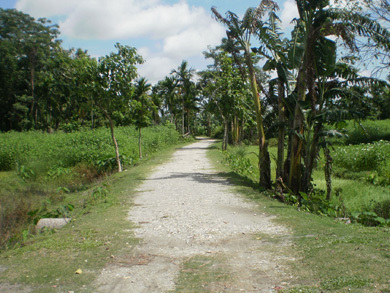 Activities under Rural Connectivity Scheme . Main Activities of SHGs in Cooch Behar : ARD based, Agril based, Bamboo-Jute-Shola Crafts etc. As per RHS data base published (revised) in the year 2009 the total no of shelter less families in the district stands at 35,233 this accounts of 689544 of the total house hold in the district. In additions to these absolutely shelter less families, we have been able to identity as many as 2,40,562 house hold where the dwelling units are one room thatched kutcha structure and may also be presumed as shelter less families. Hence, the total housing requirement for the shelter less families in Cooch Behar district in 2,75,795 units. This however reflects the total no of homeless families belonging to BPL category of rural housing. At present, the important Rural Housing Schemes being implemented in Cooch Behar district are the (I) Indira Awaas Yojana, (II) Ashray and (III) Housing for E.W.S (Amar Bari). The Indira Awaas Yojana is the in the most prominent and popular among the Rural Housing Schemes. 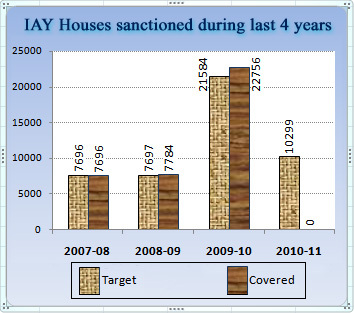 IAY is a Govt of India schemes in the Bharat Nirman Programme. The scheme in where providing grant to the selected beneficiaries at the rate of Rs 35000/- (Revised Rs 45,000) to enable him to construct a dwelling unit of his choice by himself. The grant is given in two equal installments, the 2nd installment being given only an satisfactory utilization of the 1st installment for constructing the dwelling unit by the concerned beneficiary. The scheme is being implemented by the P&RD Deptt where the funding shared by the Govt of India and the State Govt in the ratio 75:25. Funds are placed at the end of ZP in the district which then sub allots the funds to the GP/PS on the basis of yearly target fixed by the P&RD dept. The grants are paid to the ultimate beneficiaries through A/c payee cheques. The selection of beneficiary for IAY benefits are based on identified list of beneficiary, as PWL for each G.P. Based on the new system of selection of beneficiaries and amount of grant thereof the district has been able to provide IAY houses to as many as 38,236 nos of beneficiaries so far. 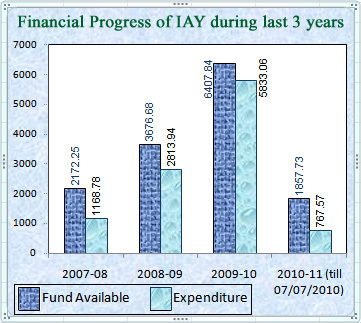 The availability of IAY fund for any district however depends on the place and amount of IAY fund utilised by the district. Ashray is a housing scheme of Govt of West Bengal in the dept of P&RD to provide houses to the poor/economically weaker section in rural areas. 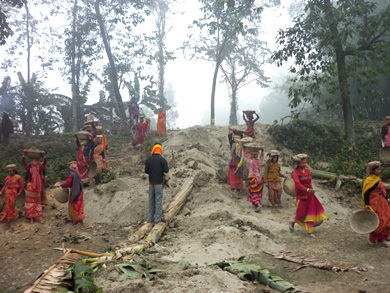 The basic objective of Ashray is primarily to help construction of houses in rural areas by providing them a lump sum financial assistance. 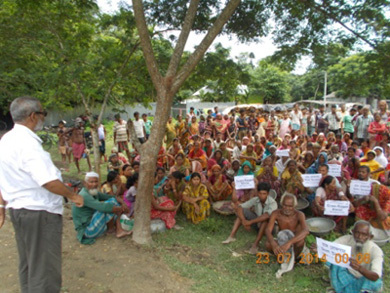 The entire fund under the scheme is provided by Govt of West Bengal. The target group for houses under Ashray are deserted and destitute women/men, widow with no major son, victim of trafficking, physically, and mentally challenged person, old and infirm persons who have their own land for construction of houses. Hence the beneficiary may or may not be in the existing BPL list but eligible to be included in the BPL list. 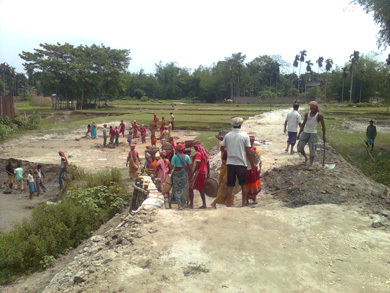 During the year 2009-10, the district gave priority to beneficiaries who became homeless due to construction of PMGSY scheme or other development scheme by PRIS. Moreover, beneficiaries who became have less due to natural calamity by cyclone, floods etc where also selected on priority basis. For the year 2009-10, the total target of Ashray unit for Cooch Behar district was 767 units at the rate of 5 units per GP and including 127 units as separate quota for Zilla Parishad�s own selection. So far we have been able to select 669 Ashray beneficiaries against the target of 767. The rest are under progress of selection. This is yet another housing scheme of Govt. of West Bengal for new construction of houses as well as up gradation/repair of existing dwelling houses throughout the State of West Bengal for Economically weaker Sections of People (EWS) who have no pucca house of his/her own. The beneficiaries are selected preferably from BPL group of people in rural as well as non-municipal semi urban areas. Priority are given to poor people in erosion/flood/disaster prone areas and people affected by Govt. projects. The Amar Bari makes provision for the scheme of pucca dwelling units for the beneficiaries having carpet area of around 25 sq. km. The cost of such dwelling unit for new construction varies between 197000/- to 116000/- depending upon the nature of areas and type of land and demography etc. Among the various departments and agencies selected as the implementing departments the Backward Class Welfare Department has taken the initiative to implement this scheme in Cooch Behar District from the year 2009-10. Selection of beneficiaries is being done by the SDOs in consultation with Executive Officer of Panchayat Samities on the basis of quota/target fixed and communicated by the BCW Deptt. to the concerned Panchayat Samities.